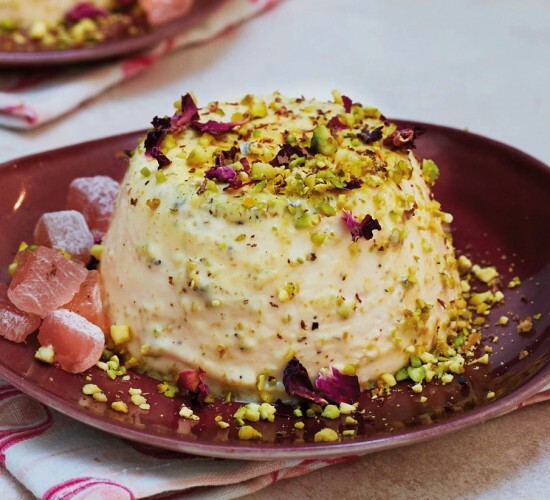 Topped with a vibrant smattering of dried petals and pistachio, this delicate panna cotta is flavoured with fragrant rose and served with sweet cubes of Turkish delight – the perfect way to round off a romantic meal. If you’re not keen on the heady aroma of rose, you can substitute lemon, almond or vanilla extract, or even orange blossom water. Soak the gelatine in cold water for ten minutes. Bring the cream, milk and sugar up to the boil in a saucepan, stir well and then turn off the heat. Add the rose water and saffron, and whisk in. Remove from the heat. Squeeze the gelatine dry and add to the cream mixture. Whisk in along with the pink food colouring. Grease two dariole moulds with butter and sprinkle each with the crushed pistachios, leaving some for garnish. Fill with the panna cotta, then chill in fridge until set. This should take about two hours. To serve, gently heat the outside of the dariole moulds by briefly dipping the base of each into a bowl of hot water. Turn out on to a plate, top with a little extra chopped pistachio, rose petals and Turkish delight cubes. Then, using a sharp knife, carefully scrape shards of chocolate onto each.